Thank you for sharing and for your support! Please have a look around, - meet the writers and contributors - become a fan and visit our book shoppe - buy a book and support an awesome program - enjoy your stay and come back often! In Autumn 2013 a handful of wordsmiths, story contributors and editors joined together as volunteers, forming a group dedicated to the preservation and archiving of non-fiction stories. These stories, entrusted to us to not only preserve but to share with the world, are included in small collections, book by book. Many of these stories are integral aspects of a family's heritage and it is our mission to ensure bits and pieces of them are not lost in the telling from one generation to the next. 70% of profits from each book are assigned to go to a specific not-for-profit program. The remaining 30% covers production expenses. The very first book produced by this dedicated and ever-growing group of writers and story-tellers is titled, Mysterious & Miraculous - Book I. Although the book was published as being authored by Angelia Phillips of flashPress and Alastar Packer of The Carolinian's Archives, several stories in it were submitted by other folks. Other writers joined to help in the editing process and then the process of actually forming the book's layout and design. After Book I launched for sales (which would not have been possible without the extensive help of Michael Friedman of Mockingbird Books putting the stories and layout together to format the book) the individuals involved decided to continue working together in the pursuit of a common goal and formed the Legacy Archives Foundation. The associated writers became Legacy Scribes, with the intent to continue collecting and recording these magnificent stories that are such integral and fascinating parts of many people's heritage, including some of their own historic accounts. Thank you for your interest and for joining us on this journey. As each book is added, a sub-page will be available where you can read more information on the book, who or what its proceeds are funding, and any other relevant data on it via the book shoppe. 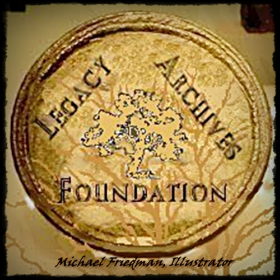 *All content on this site is under copyright and ownership of the Legacy Archives Foundation and may not be duplicated anywhere without their consent.